Categories > The Open Forum > Anyone perform stage shows? It seems like there are a lot of close up people here. My wife and I perform separate and together. 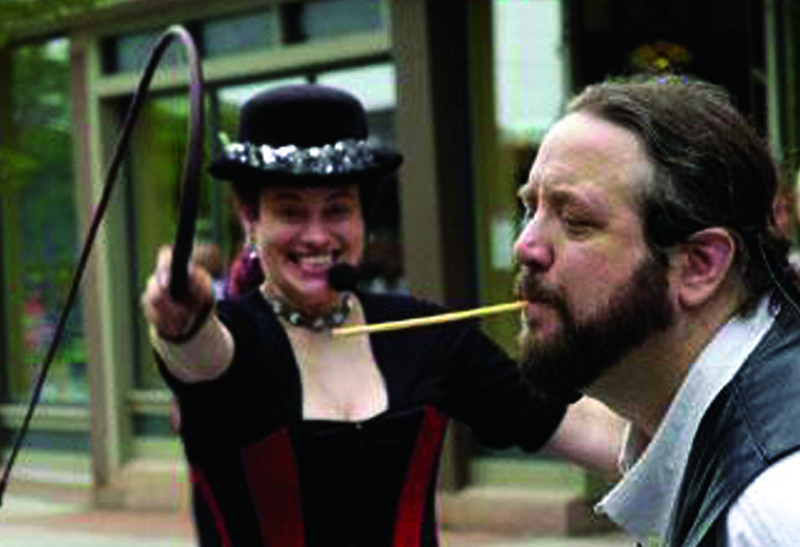 My wife juggles, stilt walks, performs magic, face paints, balloon animals, and sideshow stunts. I perform magic, mind reading, bizarre magick and seances. Together we call ourselves "Psychic Sideshow." It's a family friendly show filled with Magic, Mind-Reading, Carnival Cons, Sideshow Stunts and More. The show is like a walk down the carnival midway. I like this because it gives us a lot of leeway as far as adding material into our show. BUT, it has to fit within the theme of the show so not everything makes it. We are well-known for our "Breadstick of Death" routine. This is where Colleen the Sideshow Queen whips a breadstick out of my mouth piece by piece until a fraction of an inch remains or it gets flush with my lips. And yes, I've been whacked a few times but she has a 99.5% success rate, which is amazing. She's the only one I trust aiming a whip at the space in front of my face. This pic got us a spot on The Tonight Show with Jay Leno. We sent them the pic. They wanted video. Then they wanted us. Then the writers strike happened. But.... Once the strike was over, they called and flew is out there. We even made it to the Magic Castle while we were out there. Didn't perform at the Castle, just went there. Awesome. My wife and I are actually starting a two person mental act. Mostly light-hearted fun targeted at youth/teens. Our first show is booked for this summer, and we're trying to get our act together (pun intended) now so we can be ready to start hustling to book more shows. I must ask, do you guys do any Renaissance festivals? I ask because it seems like the show could be adapted to that environment pretty easily. We did one Ren Faire a while back. Haven't done any since because we're booked for other events. A friend of ours is trying to get something booked this year at a local venue. Ren Faire is one of the events they hold on one of their weekends. We do a lot of local festivals, private parties and we've been doing a monthly show at DiDonna's South Shore Restaurant on Saratoga Lake. This is my first post here since being invited by Tommy Ellison of Ring 35 in Birmingham, Alabama. My wife Lucy and I do perform stage magic. We have been performing together for 15 years. We also host Magic Valley Magic each October at our home Magic Valley Ranch. It is a family reunion of entertainers: recording artists, magician, and clown. The one for 2016 will be our seventh year of holding the event. We try to make it to 12-14 magic conventions a year. Hopefully we can meet all on the road. This pic got us a spot on The Tonight Show with Jay Leno. We sent them the pic. They wanted video. Then they wanted us. Then the writers strike happened. But.... Once the strike was over, they called and flew is out there. We even made it to the Magic Castle while we were out there. Didn't perform at the Castle, just went there. Haha! That is a great photo, Dan! As I said in another thread...I'm very happy that you've joined us, Bob! Thanks for inviting him here, Tommy!